It appears that Iris may be down yet again. When logging into the Iris website I was greeted with a “Hub not found” error and all of my devices being offline. 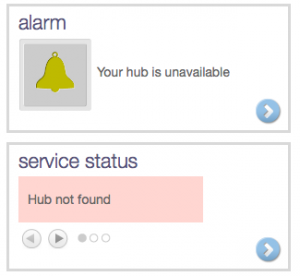 Our hub also shows an error indication again. This marks the second day in a row of system instability for Lowe’s Iris. Unlike last nights outage, this one appears to be back-end related. Iris servers are reporting to be up and responding to http requests. Are you having trouble too? Leave a comment below. Update 1:11pm: It appears that something caused our hub to go offline. A PIN reset brought it back online. Based on our past experience outages such as these are typically caused by a backend issue and have often accompanied system outages. We will be closely monitoring the system throughout the day.